Grammar practice is important, even though formal grammar study may not be. Grammar is the skeleton of a language-- the bones that provide a framework that holds individual words and phrases together in a way that expresses meaning. Researchers have found that human minds can figure out the rules of a language’s grammar by just listening to it enough-- formal teaching is not required. However, practice with the organization and structures of a new language is essential, since every language is organized differently. 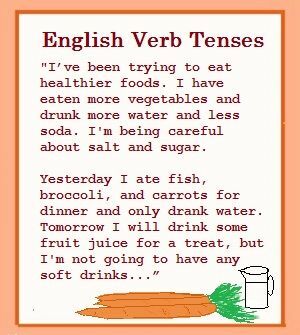 EnglishHints has a growing number of grammar practice pages to help you use English the way English speakers do. 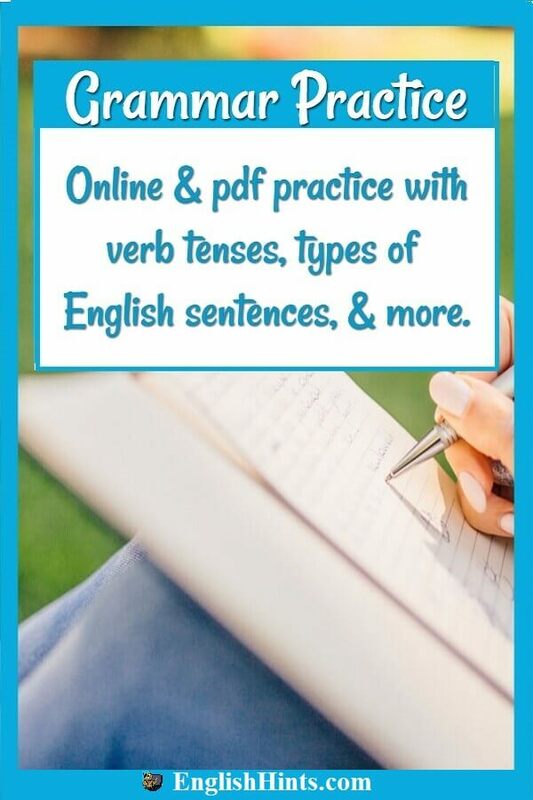 Most of this practice is available in two forms: as web pages and as pdf worksheets (see English Grammar Worksheets) that you can print out (or download by right-clicking and choosing “Save as...”). As noted above, many of these are also printable and downloadable pdfs on the English Grammar Worksheets page. For practice with parts of speech, and especially with the suffixes that can change a base word from one part of speech to another, see Word Family Practice (and Word Families that explains these transitions) and Word Formation Examples & Exercises. These pages are mainly concerned with word formation, but they do have demonstrations and practice to show how each part of speech should be used. It’s important, because if you use a noun where a verb should be (or vice versa) you may confuse your hearers. For practice with phrasal verbs (verbs used with a preposition-like particle that changes their meanings), see Phrasal Verb Quiz. 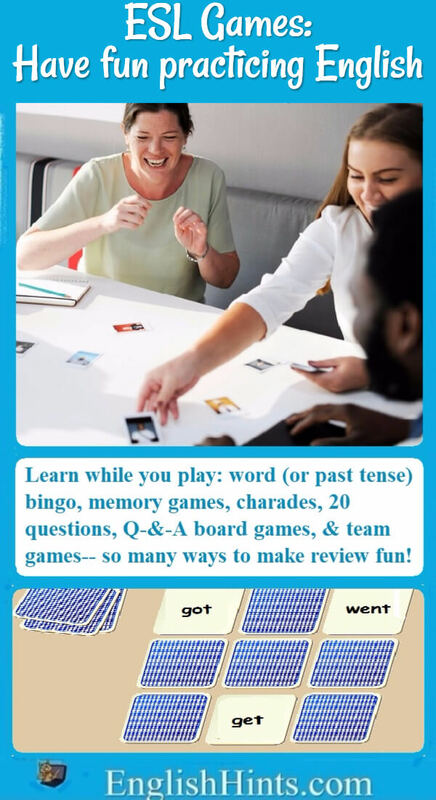 ESL games are one of the best ways to practice English-. The excitement and group spirit they create reduces stress and makes real language acquisition easier.